Since they are fastest ways for making huge amount of backlinks for their websites or blogs, some link building methods which you are using currently for promoting your website to increase the PageRank and Traffic may harm your website or blog instead of getting high PR and Traffic. 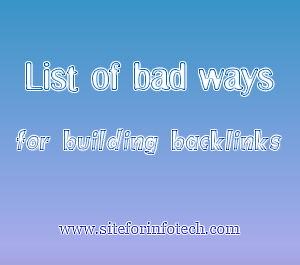 I have presented here some bad ways of building backlinks which may get your site banned, penalized, and filtered from major search engine or both. 1. 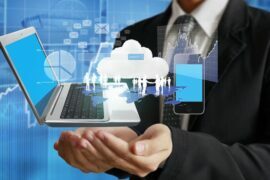 Submitting your site to 100’s of paid directories which send no traffic and sell off topic. 2. As a new member, asking same questions at many forums on the same day. 3. Asking and answering the questions by making different accounts form same IP address. 4. Signing up blogs with spammy keywords to comment on blogs. 5. Using automated bots for blog commenting. 6. Making unnecessary and unrelated links while commenting others blog. 7. Sending huge link exchange emails which look like an automated bot sent them. 8. Signing up for profiles on forums you never intended coming again there. 9. Exchanging links on huge amount sites and placing their unrelated links on your site.